The Cesare Borgia figurine brings to life one of Assassin's Creed's most memorable villains. Dressed in his decorated armour, he is indeed a striking presence in the heart of any Assassin's Creed Collection. Looking at the armour, we can clearly see the three angels engraved into the breast plate, protecting Cesare from enemy attacks. This marks him as a member of a Noble Family, and indicates his wealth and high rank. I was particularly impressed with Cesare's hair and beard combination, as they have been painted jet black by hand. The colours are also excellent for his cape and armour, making him my favourite figure in the Collection so far. The wave pattern on his under armour, something that is only noticed when looking close at the figure, or an image of Cesare in the game (or concept art). The three straps on his right gauntlet, followed by an intricate pattern. The gold dots on his knife belt strap. 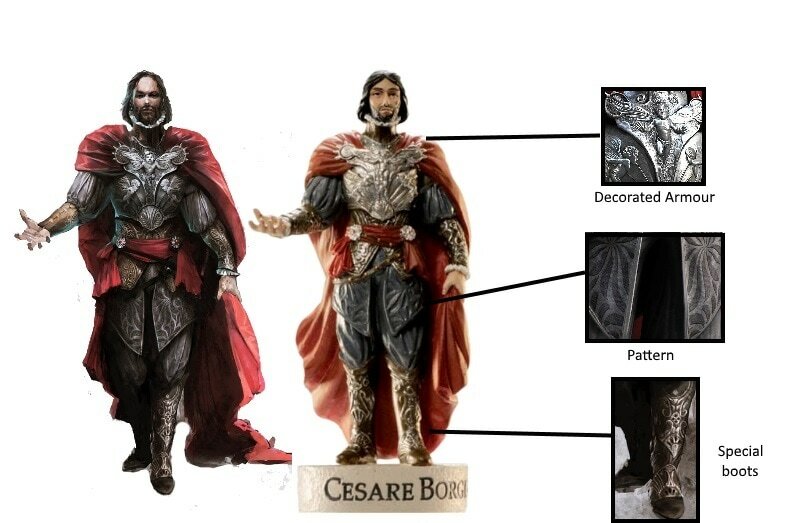 Looking at the concept art below, you can see the level of detail that has gone into recreating Cesare. We start issue #5 with some background information, and a breakdown of the Cesare figurine. Like his Father Rodrigo Borgia, Cesare was a member of the Templar Order, but often allowed his own personal ambitions and goals to take priority over those held by the Order. In 1497, he arranged to have his own brother murdered, so that he could take his place as Captain-General. Focussed on securing power and control over Europe for the Borgia family, this period is known as "The Dark Age of the Order" by Modern Templars. The Character Profile for Cesare focussing on his pursuit of power, and the ways in which he advanced his cause. Working with his Father, he constructed Borgia Towers throughout Rome to function as guard towers and headquarters in a bid to gain control. One of his main driving factors was envy, to the point of madness. Jealous of his brother's power as Captain General and his half-sister Lucrezia's suitors drove him to kill and imprison at will. He eventually went on to kill his own father to take his place as Templar Grand Master. His military success was partially down to his actions being unpredictable, leaving his enemies uncertain of how to respond. He was obsessively focussed on furthering his own personal power, and defending it against potential challengers. in 1502 he had the 17 year old Lord of Faenza and his brother drowned in the River Tiber, so that the bloodline could not become a threat in the future. ​The next section is titled "Friends and Enemies", and looks at Cesare's paranoid approach to trusting anyone in his life. The line between friend and foe was blurred for him, and he frequently turned on his supporters if he sense they might become a threat. We begin the section with Cesare's father and Templar Grand Master, Rodrigo Borgia. Also known as Pope Alexander IV, the two had a very strained relationship. Rodrigo believed that he was "The Prophet", referred to in Assassin and Templar Lore. Rodrigo was eventually murdered by Cesare. Next we look at Cesare's half sister Lucrezia, another member of the Borgia family. He became extremely jealous of her relationships with other men, and had her second husband strangled. He also took her young son Giovanni away from her, and raised him as his own. The last and possibly only true friend to Cesare was Michelletto Corellla, his right hand man. Cesare frequently called on Michelletto to assassinate targets, but ultimately became sick of his ill treatment. Attacking his master only led to him being shot and killed. 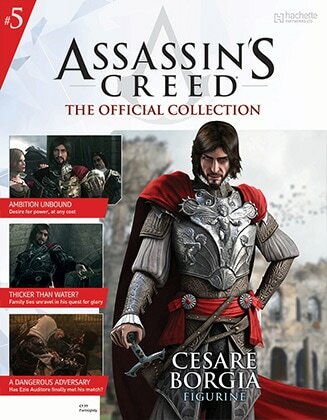 Ironically, Ezio had previously said that by working for Cesare, Micheletto had engineered his own destruction. Turning over we see: Ezio Auditore in his Brotherhood Robes, Leonardo Da Vinci, Giovanni Borgia and Pope Julius II, who all chose to stand against Cesare. In his pursuit of power, many enemies were created, all with a desire to end his rule. Although never directly standing against Cesare, Leonardo and Giovanni both hated him, and were afraid of his wrath if they should defy him. Fights and Feuds examines the conflict found within Cesare's life, and the many ways in which he asserted his power. By publicly executing Mario Auditore at the Siege of Monteriggioni, he managed to reclaim the Apple of Eden, and make an enemy out of Ezio. His final battle would ultimately be at the Siege of Vienna in Northern Spain, where he would meet his end at the hands of the Assassin. Environments looks at the places in which we see in Assassin's Creed Brotherhood. Rome, The Vatican, Valencia+Navarre and Papal States are all listed here, numerous settings visited during Ezio's Journey. Here we also see concept art and screenshots from Brotherhood. The next prototype machines are the Naval Cannons and Chariot Machine Gun, which were all destroyed by Ezio. Last but not least is The Bomber, which was first seen in Assassin's Creed II, when Ezio used it to infiltrate Palazzo Ducale. "Shoot. Shoot the Flying Demon". Overall I found issue #5 to be very interesting, focussing on the many ways in which Cesare secured his power, and the many enemies he created along the way.